Benji, a stray adopted by a PetStore.com staff member from the North Central Los Angeles City Shelter, lounges with a Cell Phones for Soldiers envelope. Cell Phones for Soldiers was founded by teenagers Robbie and Brittany Bergquist at the ages of 12 and 13. The charity has since provided more than 168 million minutes of free talk time to servicemen and women stationed around the world. Funds raised from the recycling of cellular phones are used to purchase prepaid international calling cards. On average, Cell Phones for Soldiers distributes 12,000 calling cards each week to bases around the world, care package programs, deployment ceremonies and VA hospitals. In 2011, Cell Phones for Soldiers shared 690,000 communication tools with military families, providing more than 41 million minutes of talk time. The program collected and recycled 1.5 million phones in 2011. Since 2004, more than 10.5 million cell phones have been recycled, reducing the impact on landfills. There are approximately 15,000 collection points across the nation, including PetStore.com headquarters in Garden Grove, CA. Donated phones are sent to Michigan-based ReCellular for recycling. For every donated phone valued at $5, Cell Phones for Soldiers is able to provide two and a half hours of free talk time to deployed troops. 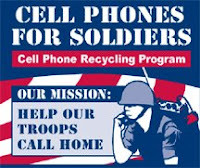 For more information about Cell Phones for Soldiers, please visit http://www.cellphonesforsoldiers.com/. To shop thousands of pet supplies and have a Cell Phones for Soldiers envelope delivered to you for free with your order, visit http://www.petstore.com.